Most companies treat service as a low-priority business operation, keeping it out of the spotlight until a customer complains. Then service gets to make a brief appearance -- for as long as it takes to calm the customer down and fix whatever foul-up jeopardized the relationship. In Uncommon Service, Frances Frei and Anne Morriss show how, in a volatile economy where the old rules of strategic advantage no longer hold true, service must become a competitive weapon, not a damage-control function. That means weaving service tightly into every core decision your company makes. The authors reveal a transformed view of service, presenting an operating model built on tough choices organizations must make: * How do customers define "excellence" in your offering? Is it convenience? Friendliness? Flexible choices? Price? * How will you get paid for that excellence? Will you charge customers more? Get them to handle more service tasks themselves? * How will you empower your employees to deliver excellence? What will your recruiting, selection, training, and job design practices look like? What about your organizational culture? * How will you get your customers to behave? For example, what do you need to do to get them to treat your employees with respect? Do you need to make it easier for them to use new technology? 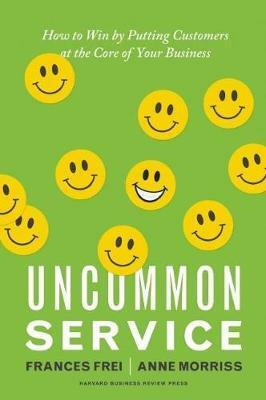 Practical and engaging, Uncommon Service makes a powerful case for a new and systematic approach to service as a means of boosting productivity, profitability, and competitive advantage.